In a move that's bound to frighten everyone, HRA Pharma, the company the manufactures the European version of Plan B called Norlevo has revised its packaging to indicate that the pregnancy prevention medication is not always effective for women over 165 pounds and doesn't work at all for women who weigh more than 176 pounds. As first reported by Mother Jones, HRA Pharma was originally prompted to look into the effectiveness of their emergency contraception by a 2011 study out of the University of Edinburgh, Scotland that found that "the risk of pregnancy was more than threefold greater for obese women compared with women with normal body mass index, whichever EC [Emergency Contraception] was taken." 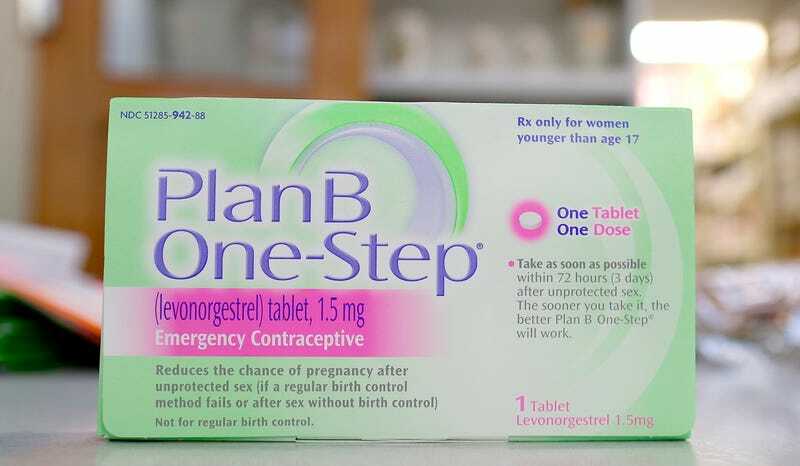 They also found that the risk of pregnancy was particularly high if that emergency contraception was made of levonorgestrel, the hormone found in many of the major over-the-counter morning after pills sold in the United States, like Plan B One-Step. The study recommended that overweight women use IUDs. If this regulation were to come to the United States, that would mean a substantial swath of American women wouldn't be able to use the medication. According to the CDC, for people 5'4", obesity is considered 174 pounds and for those 5'9", 203 pounds. In 2010, 35% of American women were reported as obese. Though those numbers are based off a flawed system of Body Mass Index, there's no denying that a significant portion of women taking the morning after pill weigh more than 165 or 176 pounds, whether that's considered obese for their body type or not: again according to the CDC, the average weight of a woman over 20 is 166.2 pounds. 11% of sexually active women have reported using EC at least once, a number that has dramatically increased over the past decade. "Studies suggest that Norlevo is less effective in women weighing [165 pounds] or more and not effective in women weighing [176 pounds] or more" and that Norlevo "is not recommended…if you weigh [165 pounds] or more"
...though the company's website hasn't updated their product information to indicate as much yet. American manufacturers for similar pills like Teva, which produces Plan B, wouldn't comment on whether they'd be making the same recommendation to their consumers. According to FDA regulations, in order for all brands to make this change, major manufacturers would have to note it on their packaging first before generic brands could do the same. Whether a version of Plan B that has the right amount of levonorgestrel in it to be effective for women of all body sizes is unclear; just increasing the amount of the hormone apparently won't work and many other hormones are considered less effective and often induce nausea. This news is about as disheartening as it gets: the big drama as far as the morning after pill is concerned has been centered around whether or not women can even get access to emergency contraception in the first place. So the idea that once they get their hands on it, it doesn't even work leaves us with not much else but ughhhhhhhhh.